The term ‘vaping’ defines the use of an electronic cigarette – or ‘e-cigarette’ – as a means of taking nicotine into the blood stream in place of a traditional tobacco cigarette. 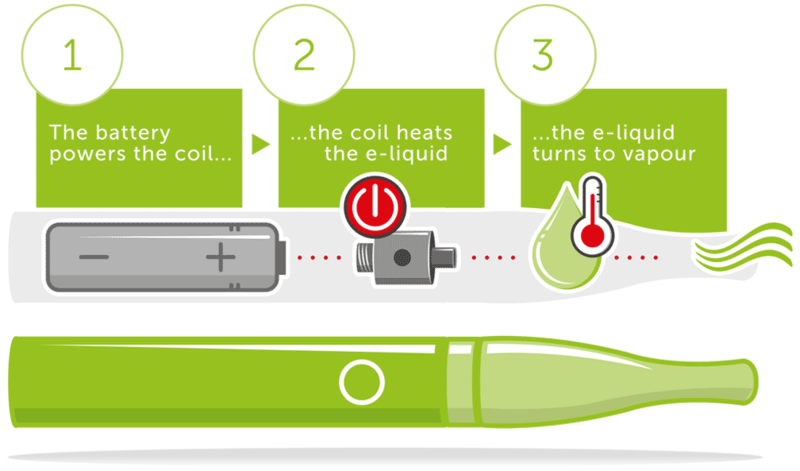 Vaping works by heating a substance called e-liquid using a battery and a coil, which in turn produces an inhalable vapour. Vaping is a popular form of smoking cessation as it is 95% less harmful than traditional tobacco* and produces vapour rather than health-damaging smoke. There are roughly 3 million people in the UK alone who currently use e-cigarettes as their preferred method of giving up smoking. *PHE – Public Health England, an executive agency of the Department of Health in the UK. The e-liquid strength you require depends on the number of cigarettes you currently smoke per day. Generally speaking, a 5-10 a-day cigarette smoker would require a 6mg nicotine e-liquid, a 10-15 a-day smoker would require 11mg, 15-20 cigarettes per day would require 18mg and 20-25 a-day calls for 24mg. As you progress on your vaping journey and your cravings decrease, you can gradually reduce the strength of your e-liquid accordingly. Here at Vapouriz we have a massive selection of e-liquids to suit every style of kit and every vaping need. Browse through our extensive variety of flavours to find something which really tantalises your taste buds. From tobaccos to menthols, fruits to desserts – we’ve got it all. With so many different e-cigarette kits out there and so much confusing vape terminology to decipher, you’d be forgiven for being unsure of what kind of kit is best for you. We think that a great starting point is with a ‘classic’ style kit, as these tend to include all of the necessary components you need to get up and running. They also require very little assembly and you don’t necessarily need previous knowledge or experience with vaping to figure them out. Pod kits are another style of e-cigarette popular amongst beginners, as they use pods which are pre-filled with high-nicotine e-liquid which provides long-lasting satisfying relief from cravings. Some pod kits allow you to fill empty pods with your e-liquid of choice, and in this case we recommend using a ‘nic salt’ e-liquid as they contain a high concentration of nicotine which is quickly absorbed into the blood stream for fast-acting relief from cravings. In order to get the very best experience from your e-liquid, we recommend that you always purchase from reputable manufacturers who use high-quality and ethically-sourced ingredients. Here at Vapouriz, our e-liquids are proudly produced in our state-of-the-art Surrey labs and each ingredient is sourced exclusively and ethically from the UK, Europe and USA. Our liquids are made of VG (Vegetable Glycerine), PG (Propylene Gylcol), flavouring and nicotine, and absolutely nothing else. PG is an odourless, colourless liquid with a thin consistency and is used in e-liquid to provide the sensation in the throat which is similar to smoking a cigarette. PG does not contain any of the harmful chemicals associated with tobacco smoke. VG derives from vegetable oil and is used as a thickening agent in e-liquid. VG is responsible for creating dense vapour clouds, which is why sub ohm e-liquids are described as ‘High VG’. E-liquid is available in a number of different types suitable for use with different devices. Each variety offers you a different sensation to suit your preference. The term ‘classic’ refers to an e-liquid with a higher content of PG than VG and is best suited for use with low-wattage starter kits such as the Fuse or V-Mini. Intended for use with low power high resistance classic kits. Sub-ohm e-liquid is often referred to as ‘high VG’, which means it has a higher ratio of VG to PG. Because of the thickening effect of VG, these e-liquids are suited for the intermediate and advanced sub-ohm devices with high-wattage which are designed to produce a lot of vapour. This style of vaping is known as ‘sub-ohm’ and tends to be more of a hobbyist practise than a means to smoking cessation. Sub ohm vaping produces amazing flavour payoff and huge cloud production. Intended for use with high power low resistance sub-ohm kits. 50/50 e-liquids contain an equal ratio of PG and VG, making them suitable for use in a wide range of low-power devices. 50/50 liquids are ideal for new vapers as they provide a perfect balance between flavour and vapour production, whilst also providing smooth and satisfying nicotine delivery. Intended for use with most vape devices. Nicotine salt e-liquids, referred to as ‘nic salts’, perfectly simulate the strength and throat-hit sensation of the nicotine in a traditional tobacco cigarette. The nicotine, which is derived from salt (hence the name), is absorbed in to the blood stream far quicker than standard nicotine-containing e-liquids. Making for very satisfying vape which is particularly appealing and ideal for smoker looking for a stop-smoking aid. Vape kits, which come in all shapes and sizes, are the device used to turn e-liquid in to vapour. On the whole, vape kits fall in to one of two camps: Classic or Sub-Ohm. These kits are more often than not the starter kit of choice for most vapers. Most classic kits are ‘pen’ shaped and are for use with high PG e-liquid. Classic kits produce moderate amounts of vapour and provide a ‘smoke-like’ sensation. The term ‘sub-ohm’ relates to resistance of the coil (heating element) being less than 1 ohm. This combined with a more powerful battery produces high levels of vapour often referred to as clouds. These devices are for use with high VG e-liquid. 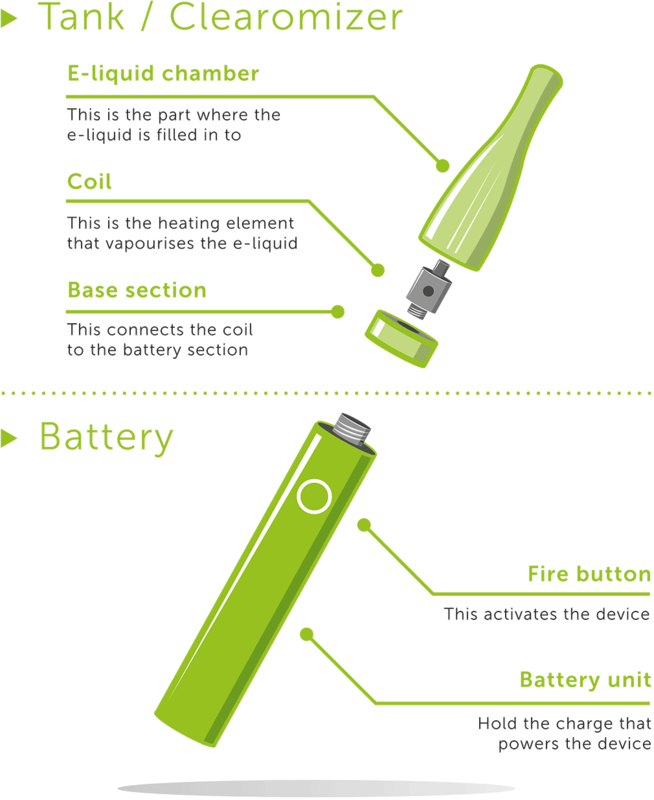 The vast majority of electronic cigarettes consist of 2 main components: a Battery and a Tank, and work in the same way. There are countless different vape kits on the market, both classic and sub ohm, in differeing shapes and sizes, with advanced funtionality and features, but this basic principle remains the same. It has been widely reported that you’re far more likely to quit cigarettes for good if you can avoid smoking completely for 28 days. To make those initial days a little easier, we’ve put together some helpful tips which should get you off on the right foot on your vaping journey. Planning is often the most important step of any pursuit, and quitting cigarettes is no different. To prepare yourself for this journey, it’s a good idea to pick a suitable start date and make sure you’ve got a decent supply of all the essential items you’re going to need, such as coils and e-liquid. You can also take advantage of the many stop smoking apps available, such as Cessation Nation and Livestrong, which provide ongoing advice and motivation and helps you monitor your progress. We also have a number of dedicated Vapestores nationwide, so please feel free to pay us a visit for expert face-to-face support and guidance. There are so many benefits just waiting to be enjoyed when you quit cigarettes, including improved health, fresher breath and considerable savings. Remind yourself of these benefits and catch yourself before thinking about reaching for that cigarette packet. Quitting smoking isn’t easy for anyone, and there will be times when you’ll feel like abandoning quitting entirely. Always keep your reasons for quitting at the forefront of your mind to help you stay on track. Always remember to congratulate yourself for reaching milestones on your quitting journey. Making it through a day, week or month without cigarettes is a big achievement and deserves recognition, so reward yourself with a little treat each time you reach a significant point. Research has proven that the endorphins released during exercise do wonders for reducing cravings. We recommend that you take up a new sport or regular walks to help take the edge off those pesky nicotine cravings. Stop smoking now and make the switch with these amazing and easy-to-use Quick Start Vape Kits. It comes with e-liquid and everything you need to get started.